Artist Henrique Oliveiraa was a student in São Paulo, Brazil when the plywood fence outside his window began to peel and fade into different layers and colors. The wood, called tapumes in Portuguese is ubiquitous in the Brazilian city, serving as enclosures and barriers for various sites. When the fence was dismantled, Oliveira harvested the remains and used them as materials for his senior show. 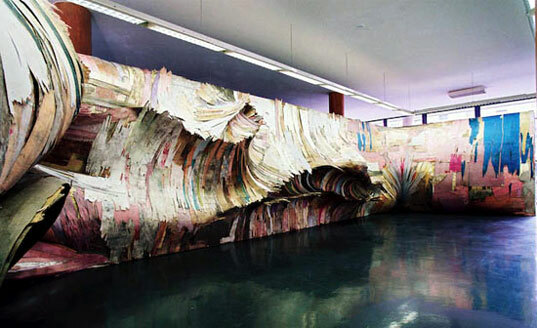 The result propelled him into his current work: undulating, swirling, bulging peels of wood layered onto hallways and walls in daunting forms. His most recent show will be called, fittingly, Tapumes. Oliveira begins with a PVC skeleton, tacking curls of scrap wood around established bends and tucks. He finds the bulk of his material in the dumpsters of São Paulo, choosing pieces that are splitting and decaying — affected by city life, then utilizes those aesthetic elements in each artwork. The laminate element of the wood is stripped from its basebord and arranged on a work like a brushstroke. 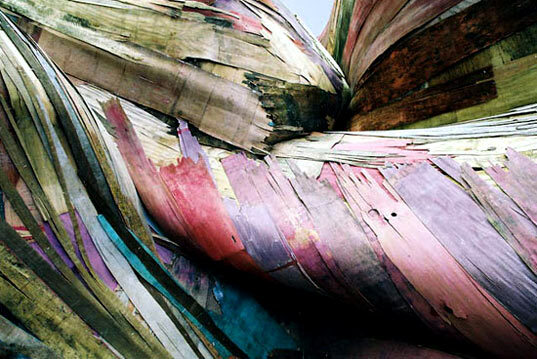 Each massive, writhing art piece represents a combination of techniques used in architecture, sculpture and painting. The artist seeks to address issues of perception and decay in his work — while stunning us with the glory of dumpster scrappings. His stormy pieces dissolve the barrier of order and swirl into expressive, dynamic forms. The show Tapumes, will be on display from March 26 – May 9th, 2009 at the Rice Gallery in Houston, Texas.